In 2010 Stockholm was selected as the first European Green Capital. Ambitious mitigation goals include cutting CO2 emissions by 44% by next year and being 100% powered by renewables by 2050. The Action Program on Climate Change includes a number of measures, from a Clean Vehicle target to the phasing-out of all fossil fuels by 2050. Stockholm is built on 14 islands and is characterized by many waterways and parks. Due to its focus on environmental sustainability, in 2010 Stockholm was selected as the first European Green Capital. 85% of Stockholm’s inhabitants are employed in the service industry and there is almost no heavy industry, which helps to maintain the city very clean. One of the five fastest growing cities in Europe, with currently around 900.000 inhabitants, Stockholm is Sweden’s capital, biggest city and its cultural, political and economic center. The city is very determined to reduce its CO2 emissions. The goal is to cut carbon emissions by 44% by next year, compared to 1990 levels. Also, by 2050 the city aims to be 100% powered by renewable energy. Actions are following intentions: Stockholm’s CO2 emissions have already been reduced from 5.3 tons of CO2e /person in 1990 to 4.0 tons CO2e/person in 2005. Climate change will affect Stockholm, with temperatures rising, heat waves increasing, drier summers and wetter winters. The main threat will be the potential impacts of Lake Mälaren flooding, which would affect buildings, industries and arable farms. A change in groundwater levels could also pose a greater risk of landslides, erosion and soil chemistry variations. “We know it is possible to combine economic growth with strong environmental measures. Our cities are putting into practice many innovative and effective strategies to protect the environment” said mayor Sten Nordin. “With our strength, knowledge, experience and successes at the local level, the local governments of our cities play a crucial role in climate protection”. 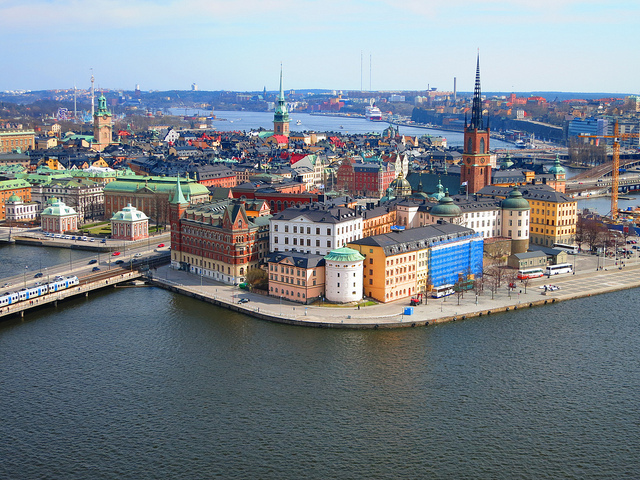 Building on its Action Program on Climate Change approved in 2007, Stockholm is implementing a number of measures which will help the city fulfill its mitigation and adaptation goals. One of the most ambitious goals is to ensure that Stockholm is fossil fuel-free by 2050. In order to get there, the city government has produced a Roadmap and a series of detailed action plans. The bar was set very high, and it will require decades of continuous and unabated efforts. But Stockholm is already on the right track. All coal and fossil-fuel powered public and private heating will be gradually phased out. Smart grids and a target of at least 30% overall reduction in energy consumption will ensure greater energy efficiency. Though blessed with considerably less light hours than southern European cities, Stockholm is also exploring the potential of photovoltaic rooftop generation and has already launched a measure to cover all the rooftops of the huge harbor with PV panels. Energy efficiency of existing buildings can be improved up to a certain degree, but private partners in building construction will need to do more. Transport in a growing capital is both a major source of GHG emissions and an important marker of sustainability. This is why 15 years ago Stockholm launched its 100% Clean Vehicles target, to be reached by 2050. The results are more than encouraging: nearly 50% of the cars sold in Stockholm in 2012 were clean vehicles, all inner-city buses operate on biogas or ethanol, 100% of the waste-lorries and 40% of the taxis are bio-fuelled or HEV. Already 98% of vehicles property of the City are green. Also, a Urban Mobility Strategy for 2030 is currently being developed, which intends to transform the city so to reduce the need to travel and make it possible to make more journeys by public transport, on foot and by bicycle. Constantly monitoring its progress in reaching very ambitious goals, Stockholm is forging a path for other like-minded cities. Stockholm is a Member of ICLEI See Stockholm’s profile on the carbonn Climate Registry.